Tudor has Master degree in sensor fusion in underwater robot navigation, PhD in computer vision, 3D mapping and semantic representation of visual data. His expertise is also applied research in machine learning. 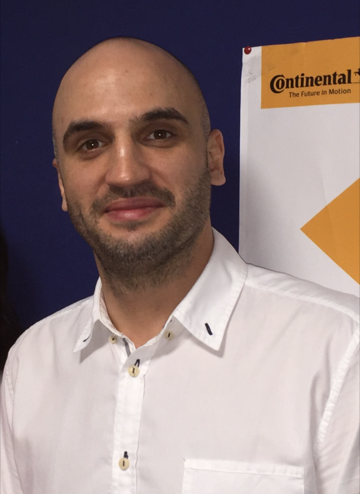 His current activity is ADAS – Advanced Engineering Timisoara – technical coordination of Ego-localization domain, with applications in multiple autonomous driving projects within Continental. Description: Commuting has become an integral part of our lives. Nonetheless, driving has always represented yet another stress element of our day-to-day lives, as we constantly deal with traffic jams, be on the lookout for other, often unpredictable, traffic participants and so on. We develop innovative ways to use artificial intelligence in order to transform commuting into a worry-free and relaxing experience. Tudor will present research and development direction, tackling various topics, such as: driver aid systems, security and biometrics, fault detection and mobility optimization.